Damak released its midwinter collection a few days back. Damak midwinter collection 2013 includes casual wear and party wear dresses. The dresses are made according to the current style in eastern wear. Long kurtis as well as dresses with long shirts and churidaar pajamas make up this mid winter collection of Damak. Most of the kurtis and shirts in Damak midwinter collection 2013 are embroidered. The collection has dresses for all types of ladies regardless of age. Thus, we think that quite a few women will find Damak mid winter collection 2013 to be quite appealing. Damak was established in Bradford, England many years ago. It later on moved to its present place and a few years after that, it started to sell its outfits online. 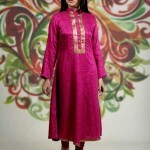 Its experience has refined its approach and enabled it to offer more stylish dresses for women. 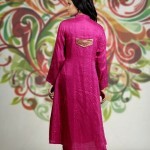 It has a team of designers, embroidery artists and tailors, who are quite skilled in their work. Thus, it is able to provide the best quality clothes for ladies. Every season, it releases new designs. It released Damak winter collection 2012 last and that was a success. Damak provides a wide range of dresses to its clients. The dresses are available in different sizes and many of them are offered in different colors also. It provides its outfits through its own outlet and online.